There are lots of research conducted in our country pertaining to pets and some of the results are perplexing. One of them says that children with pets are more sympathetic and less nervous. They even get more exercise. But the one thing that has been found is that your kitty can teach your kids financial planning. We know you will not believe it. But it is true. Money Matter: There are many adults that overspend due to the fact that they are unable to separate necessities from luxuries. This makes the task of children even more difficult in distinguishing between the two. How Pets Help? Pets assist kids in drawing a demarcation line between wants and needs. One simple exercise to do this by making your kid sit down and make a database of all the ways you spend on your cat. You can include catnip, food, veterinary care, leashes, professional walkers, pet sweaters, a scratching post pavilion, etc. Then request your kid to split the list into needs and wants. Veterinarian care and food can be categorized under needs. While the rubber toy that you got for your feline can be considered a want. Sometimes, it is very difficult to make the distinction even for parents like: Is it important to pay $ 11.99 for the cat claw trimmer? But if you do not pay for it, your kitty can destroy your favorite furniture. Teach your kid that life is all about trade-offs, which would give a valuable financial teaching to your kid. Money Matter: Learning to develop a simple budget is a great life skill. According to American Pet Products Association, on an average, the most common cat expenses run approximately $ 102 on a monthly basis or more than $ 1200 per year. No matter the magnitude of your individual pet budget, know what is and stick to it. How Pets Help? To make your kid learn this most important financial lesson, tally the costs of the products on Wants and Needs list in two distinct columns. You can commence with food. Start by answering the question: what is your cat eating? How much expenses do you need to make on it on a daily basis, weekly basis, and monthly basis? These questions would make the task easier. To compute the monthly food expenditure, multiply the amount of meal exhausted by the price. But of course, there would be certain expenses that would be difficult to quantify. It has been estimated that a mundane vet care costs approximately $ 196 on a yearly basis, the professional groomer costs $ 43. Once you determine the monthly needs of your pet, compare it with the national average. If the expenses are above average, do not fret. This is the perfect opportunity to make your kid learn about economizing. Compare the prices of various online pet stores and then zero in on a brand that is ideal for your kitty. Read the product label and select the best product for your kitty. Also, try to make your kid understand the need for finding a cost-effective option for pet care expenses. You can even ask your kid to contribute a little bit of cash from their pocket money. This way you will make him understand the pleasures and pains of budgeting. Money Matter: As human beings, we have been taught to keep enough money aside for a rainy day. In case of an unforeseen event or emergency, you need to have some cash to look after yourself. The same thing is true with your cat. Though your kid does not know the concept of a rainy day, it is important for your pet. How Pets Help? It has been researched and found that on an average surgical vet visit costs roughly $ 400 for kitties. Hence, it is important to plan the finances accordingly and keep some funds for a rainy day. This is your perfect opportunity to teach your kids about the importance of savings during contingencies and emergencies. Ensure that your kid knows in the end that it is smart to hoard $$ a minimum of a week away!!! 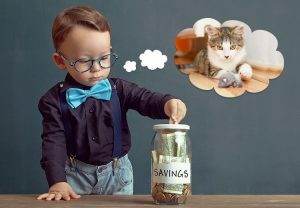 So, what lessons is your kitty teaching your kid about financial planning?